On Saturday, February 8, 2014, I will be leading the Wildlife Photography Walk, sponsored by the Friends of Heinz Photo Group, starting at 9am in the Visitor Center of the John Heinz National Wildlife Refuge in South Philadelphia, near Philadelphia International Airport. We'll be walking and photographing in several areas of the Refuge, including near its Impoundment Pond, Darby Creek, Hoyes Pond, and through some of the deciduous woods areas of the Refuge. The walk will last for about three hours. During the walk I expect to discuss the challenges of cold weather photography. Right now at the Heinz Refuge, the resident Eagles are soaring, the ducks are swimming and flying, and to many, it's surprising how many birds and other animals can be seen. 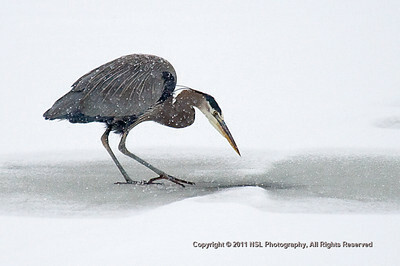 With snow on the ground, landscape and wildlife images can have a special look. It looks like it will be cold and possibly snowing Saturday morning. Even if that happens, the walk will go on. Bring something to protect your camera/lens if it's snowing. I use Think Tank Photo Hydrophobia products, but there are many alternatives available, including the use of plastic trashcan bags with rubber bands. If you run late getting to the Refuge on Saturday, the volunteers and staff members at the front desk will know our beginning route, and can contact me via cellphone to give you a chance to catch up. If we've left when you arrive at the main lobby of the visitor center, just speak to those at the front desk who will help you. I hope to see you on Saturday morning. If I can drive Saturday, I'll be there Ned. Trying to make it according to the weather. While our group was small due to the frigid temperatures and threat of more snow, we had a good walk. Among the birds we saw was a rare sighting of a Long Eared Owl, and a wonderful opportunity to capture an image of the Female Belted Kingfisher.